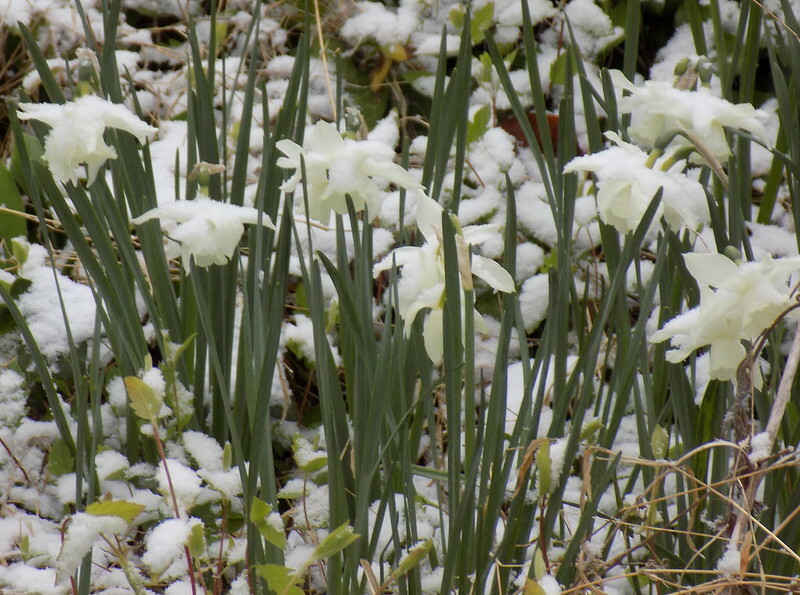 March came in like a lamb but not for long. The lions and lambs of March keep trading places this year. 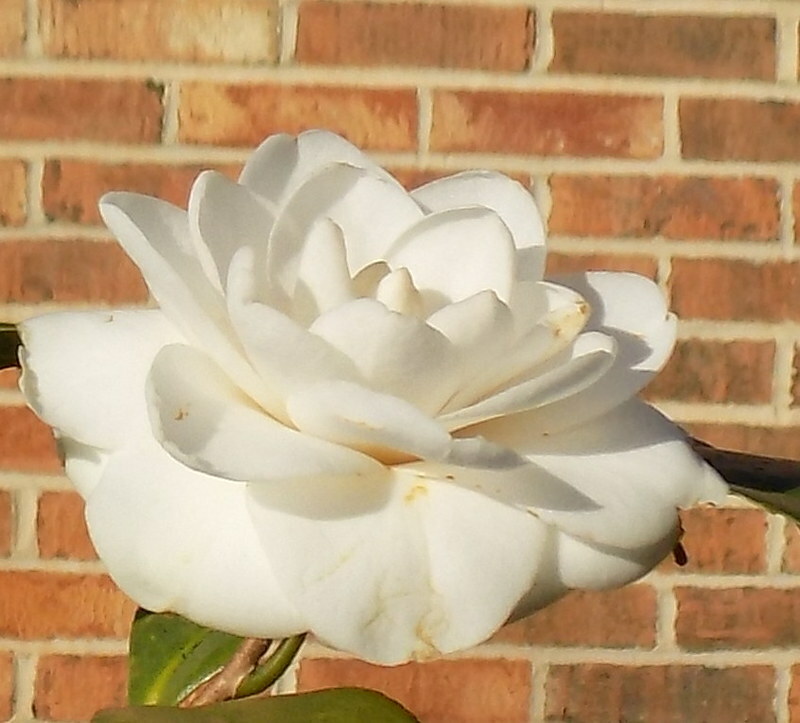 My camellias bloomed early and were so pretty that it wasn't a big deal when they got freezer burn from the ever changing weather. 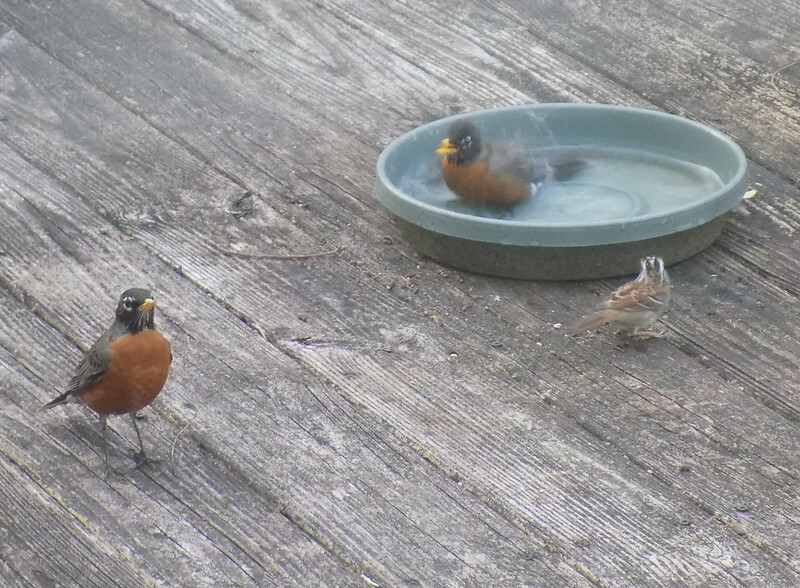 The American Robins have been out full force. 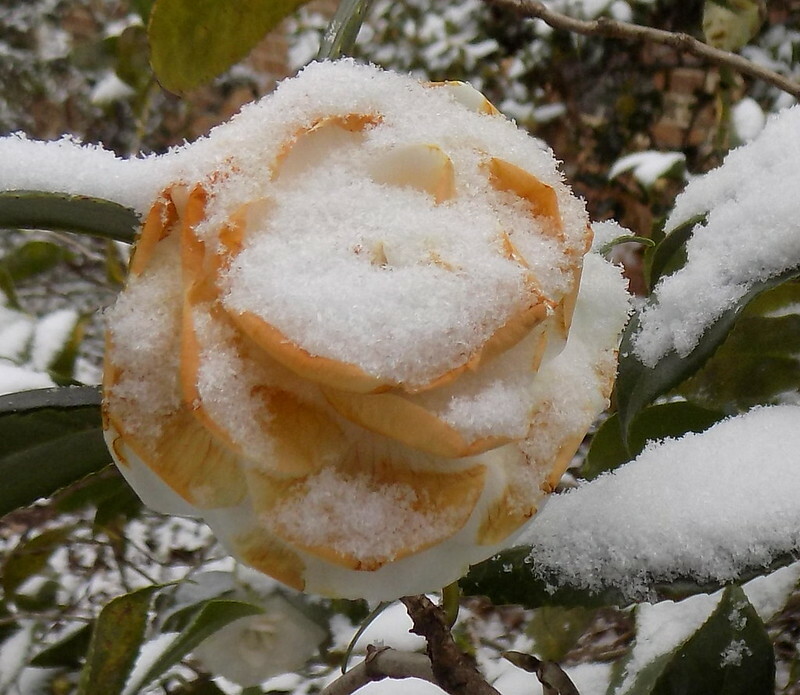 I almost think the camellias are as pretty with their cold snap color against white. 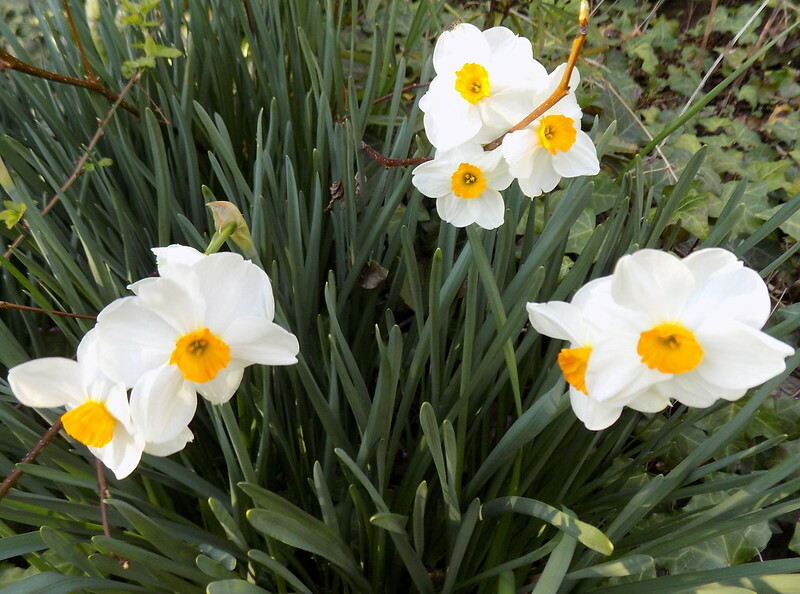 I need to weed around my narcissus and cut out some of the volunteers. Because of the ever changing weather I've taken a lot of shots because I know there will be a lot of damage with everything ahead of itself. 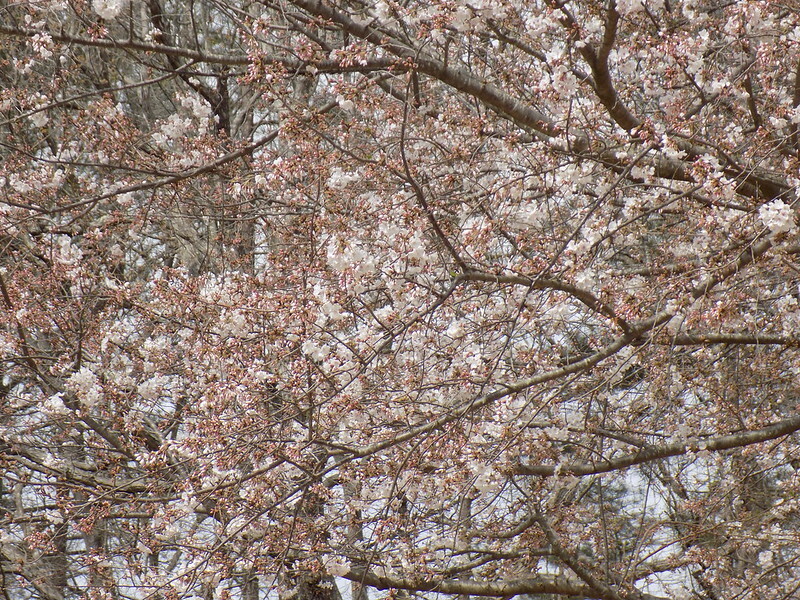 I made a point of photographing the trees below yesterday. They are always so lovely. I was particularly motivated to take a lot of pictures yesterday. 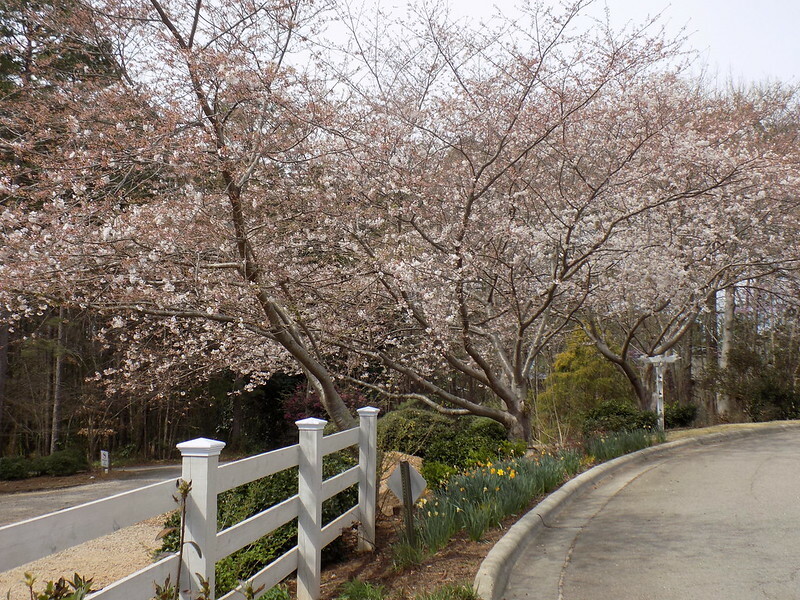 Some of the flowers frequently start blooming in March but others are about 6 weeks ahead of schedule. I took the rest of the pictures in this post today (Sunday, March 12, 2017). 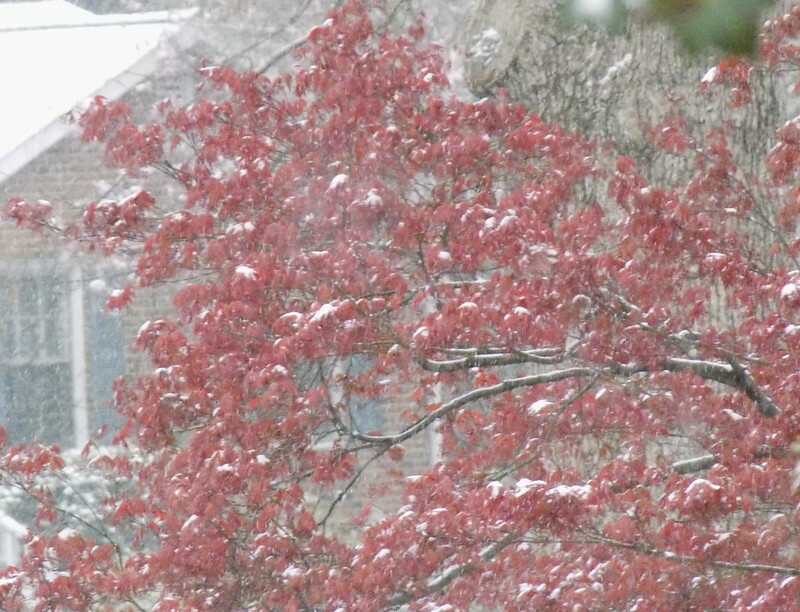 Yes, it is snowing this morning. There's a lot of white on white. 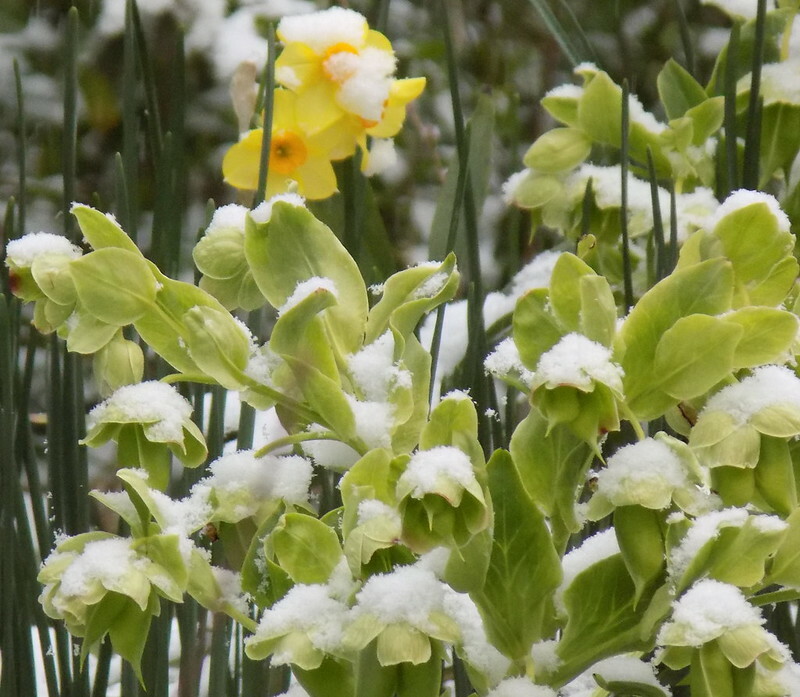 I do enjoy photographing flowers in the snow. 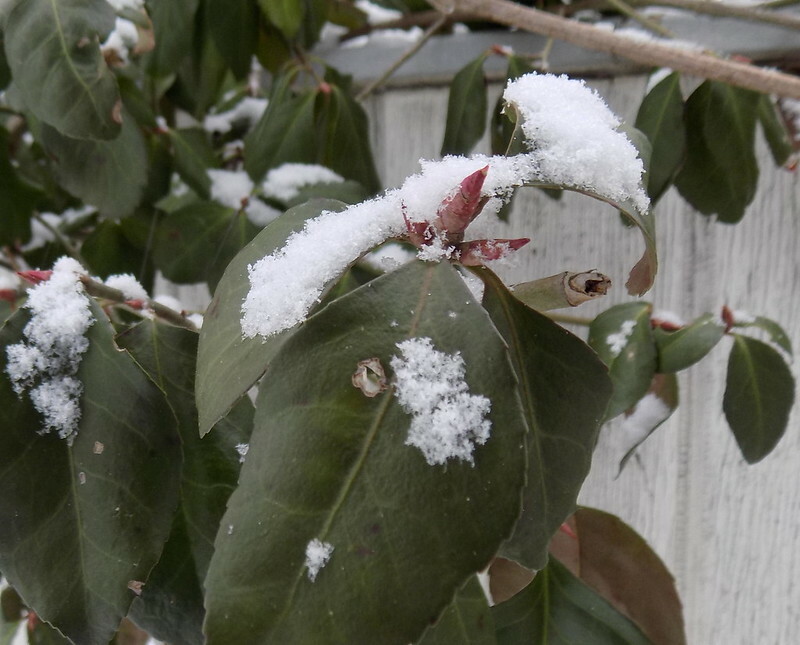 It's a soft snow and not too cold. 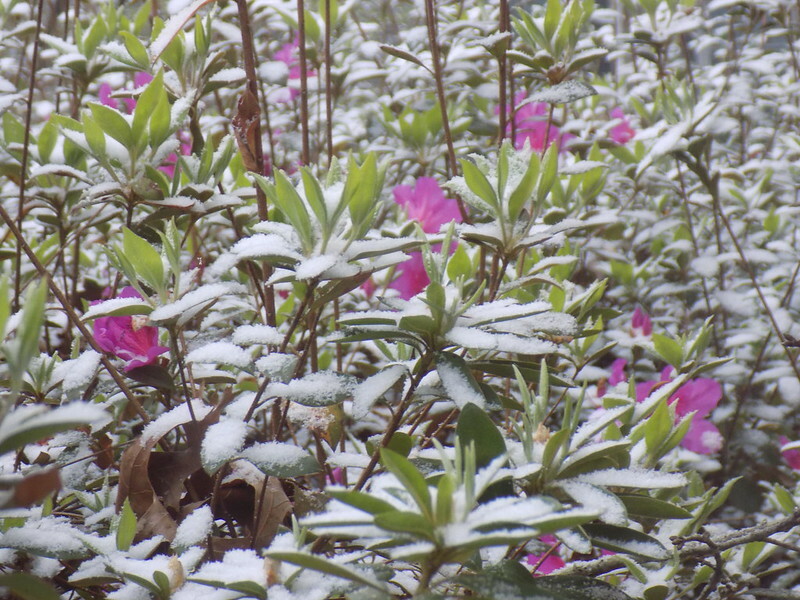 The crazy part is my azaleas are blooming a month early for some and a month and a half early for others. This is definitely a first for me. 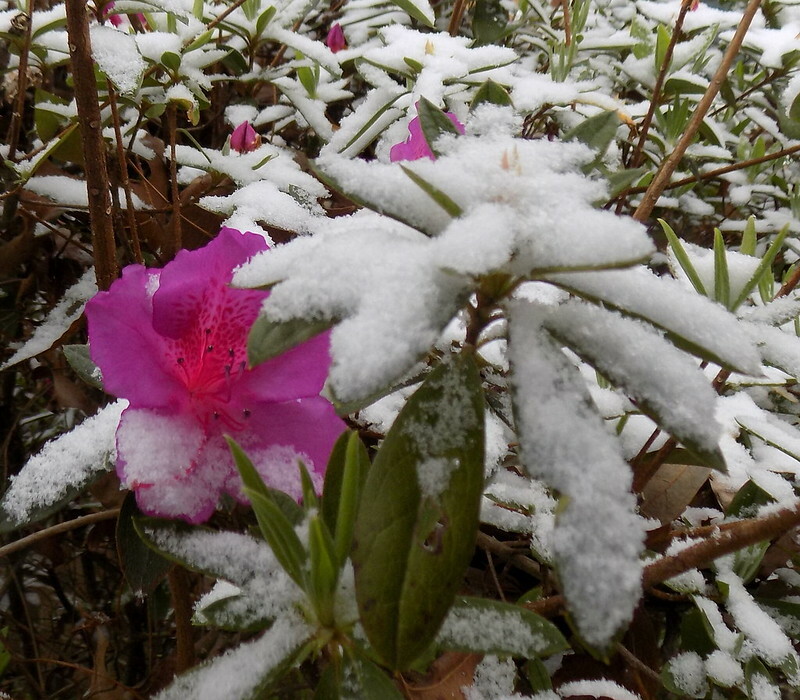 I've photographed narcissus in the snow many times but I've never photographed azaleas in the snow. I worry about the farmers as they've had problems with strawberries and other plants getting ahead of themselves. 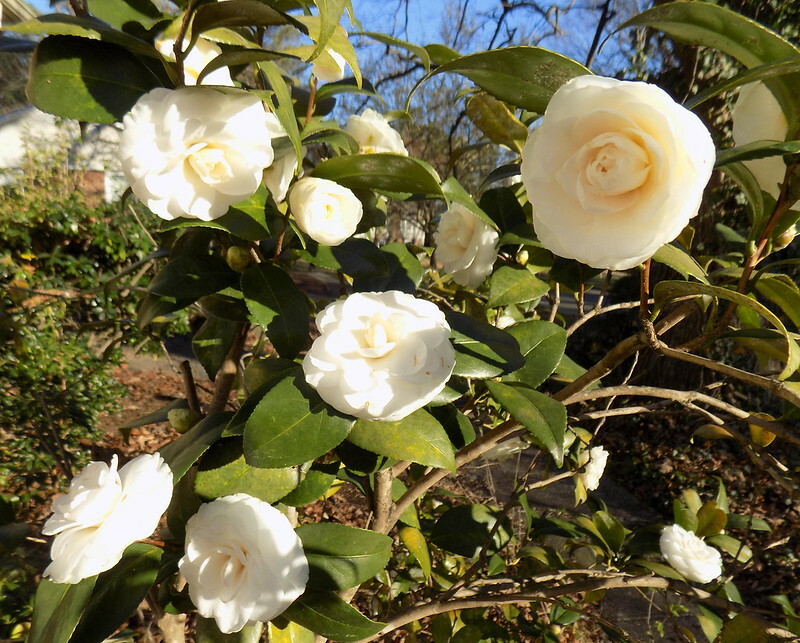 Back to the many faces of my camellias. I have photographed them in a lot of phases. 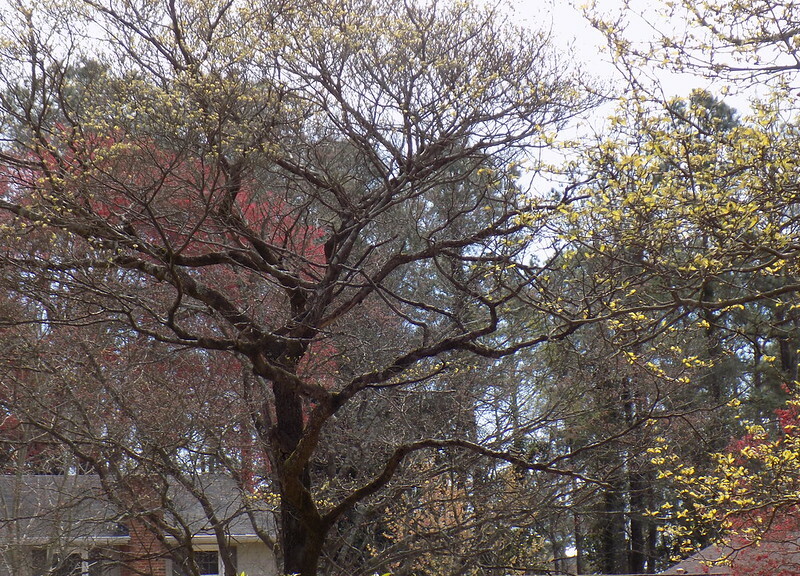 My neighbor's Japanese Maple has already leafed out. 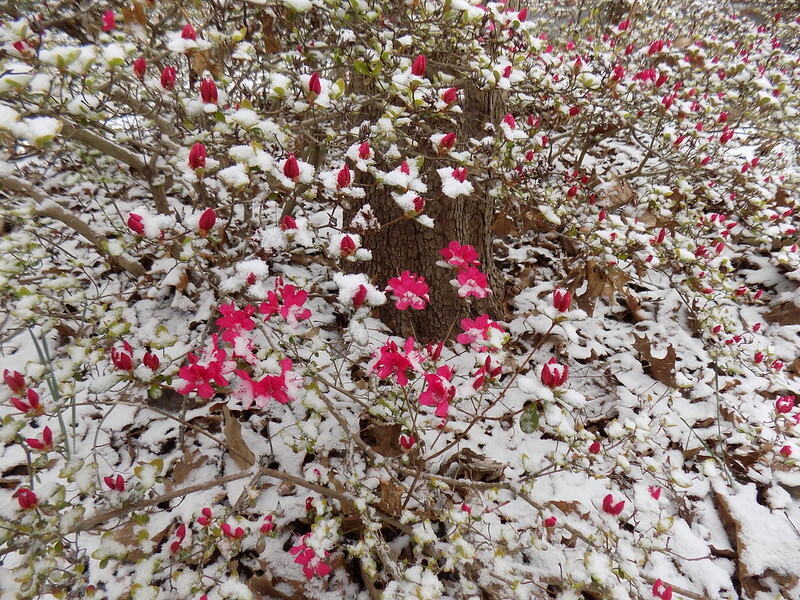 I'll end on another one of my azalea bushes. 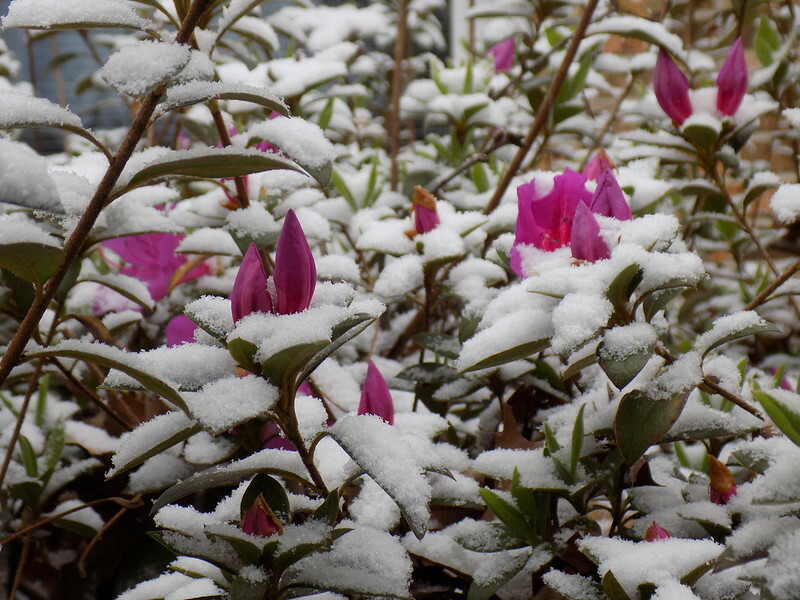 Oh no, those blooms will freeze. It's been really warm this weekend, but I did not get to enjoy it because I was out with a cold bug that kept me sleeping all weekend long. Hope all's well. 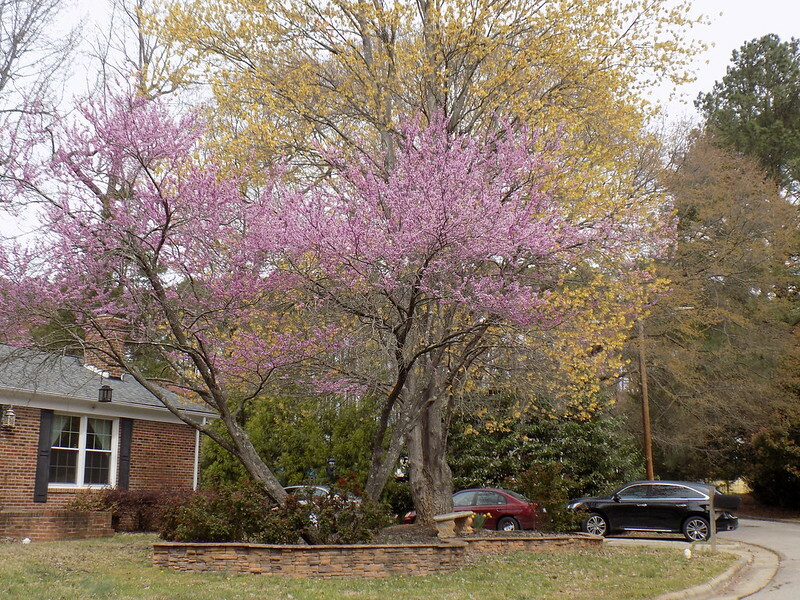 The weather is confusing to people, wildlife and plants. I hear a storm is currently brewing in the east and we in the northwest have had sporadic snowfall. 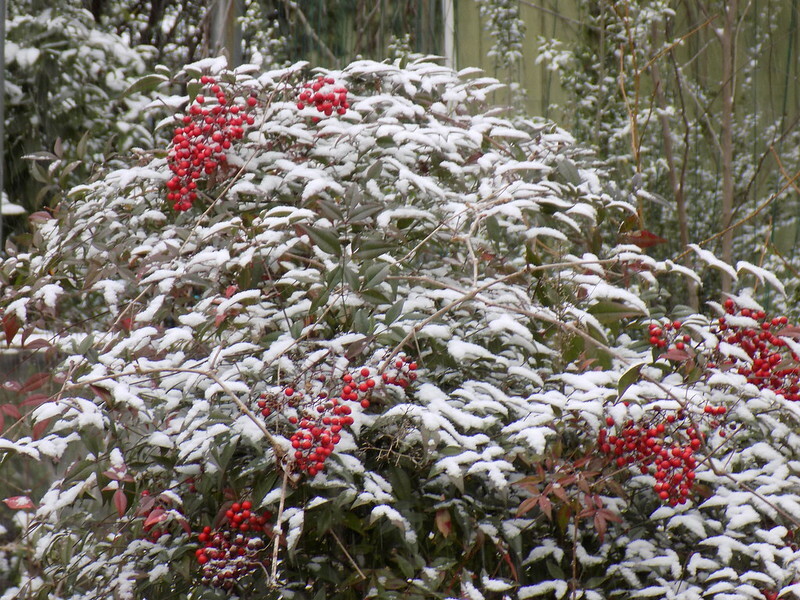 All this wintry weird weather makes for some very pretty pictures though. 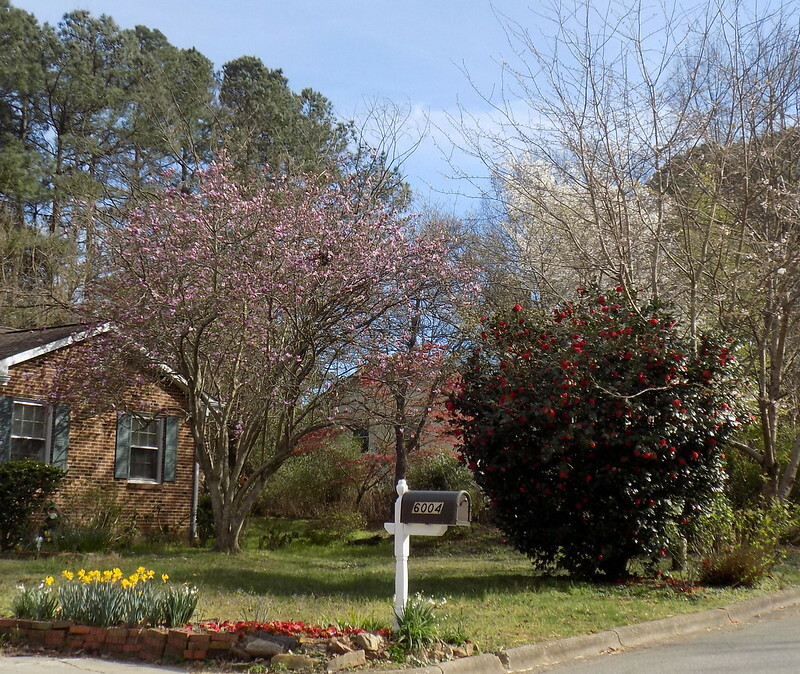 But my favorite in this round is the scene with the country mailbox that looks like spring. 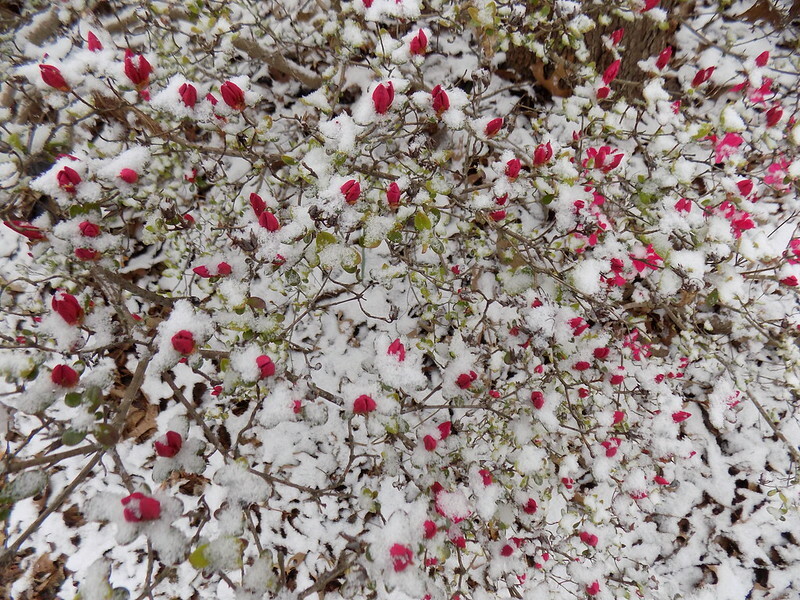 Every flower is just beautiful with its dusting of snow. 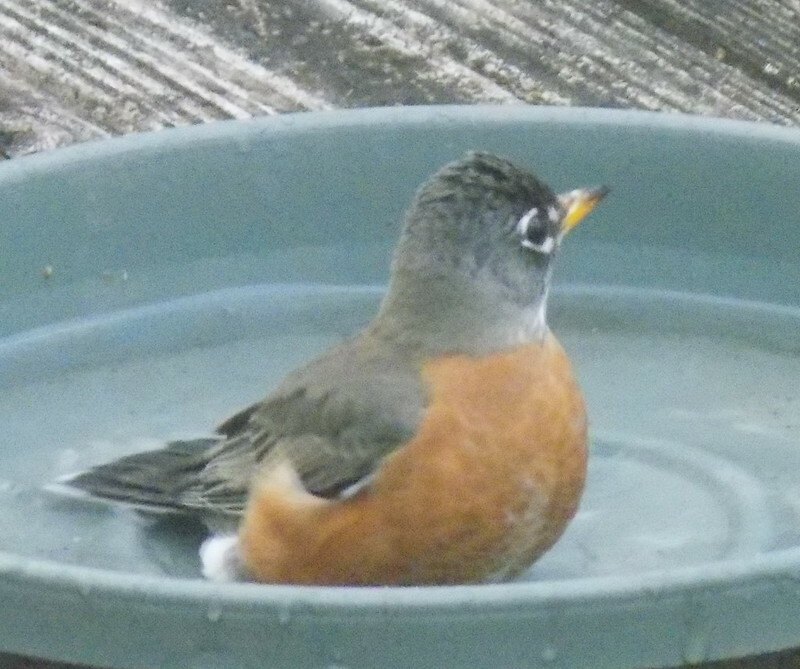 But the robin looks a little bamboozled by the changing weather and I don't blame him. 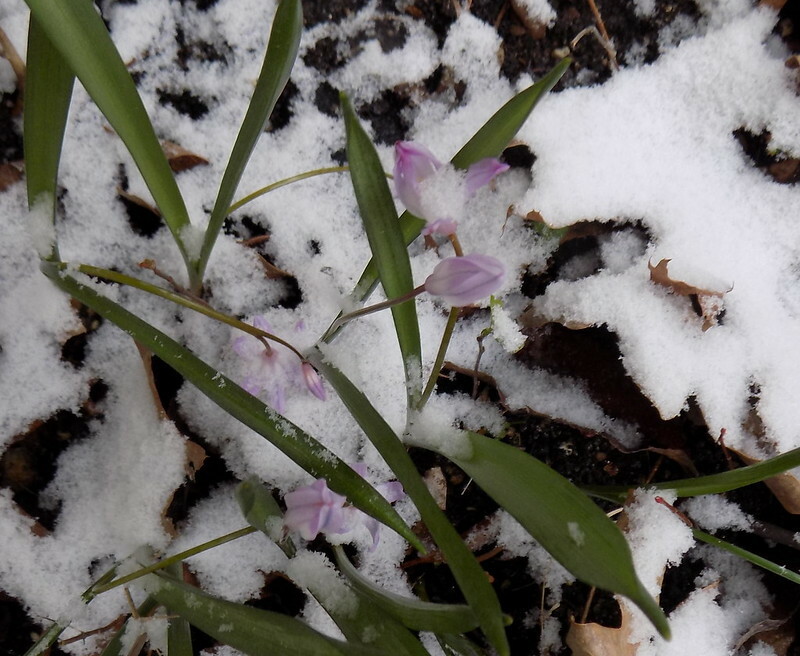 I hope at least some of the spring flowers survive. 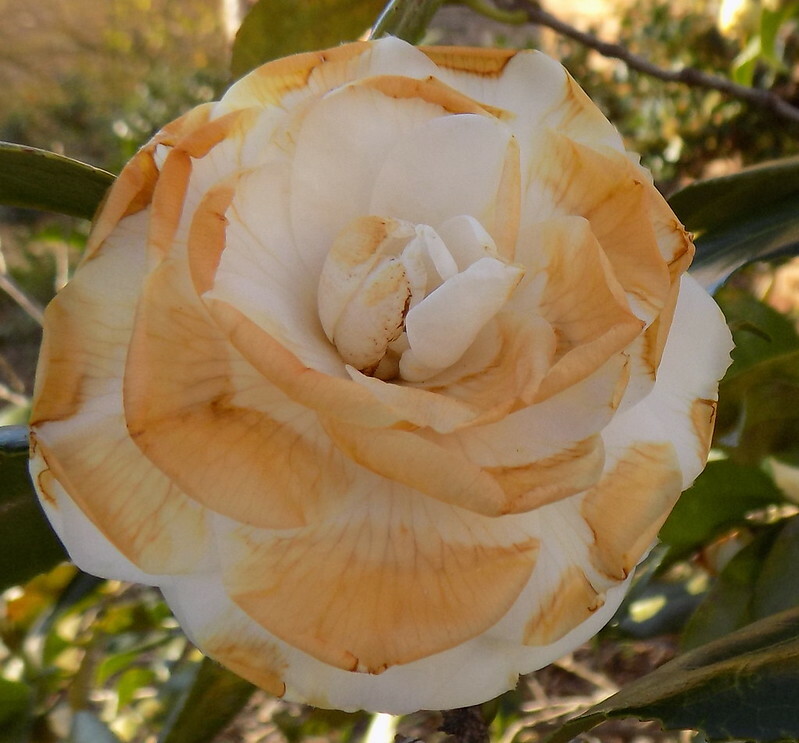 I kept going back to the pictures of the camellia blossoms -- they look bronzed -- really quite beautiful in that stage as well as in their full glory. 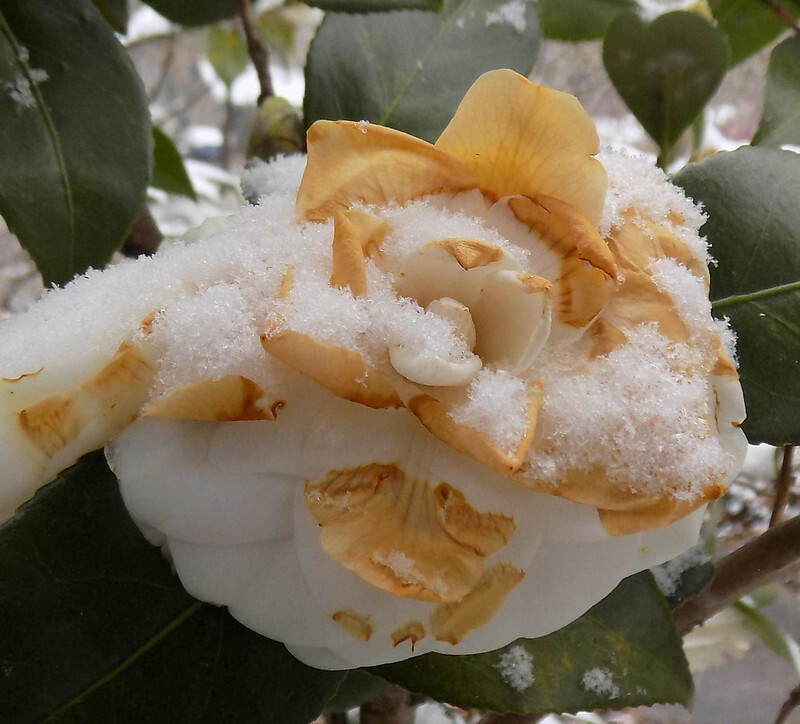 I remember (from Oregon) that they never lasted a long time, but I don't think we really ever got that golden frostbite --- I think the cold rain just battered them to death when we had one of those changeable kind of winters. Anyway, I loved the whole post. Happy March.